Geneva based auctioneers Phillips and Christie’s will offer five Vintage Panerai watches in their upcoming auctions between 12 and 14 November 2016. First of the five is lot 82 – a Ref. 6152/1 “Luminor Panerai” with Rolex movement and crown-protecting device in The Geneva Watch Auction: FOUR (session one: 12 November 2016, 6 pm, lots 1-100). Read more about this Ref. 6152/1 in our Watch Point. Lot 152 – a “warbird” in shape of a Ref. 3646 / Type D is the second Vintage Panerai to be auctioned at Phillips (session two: 13 November 2016, 6 pm, lots 101-196). Read more about this “Kampfschwimmer” in our Watch Point. The following lot 153, a Ref. 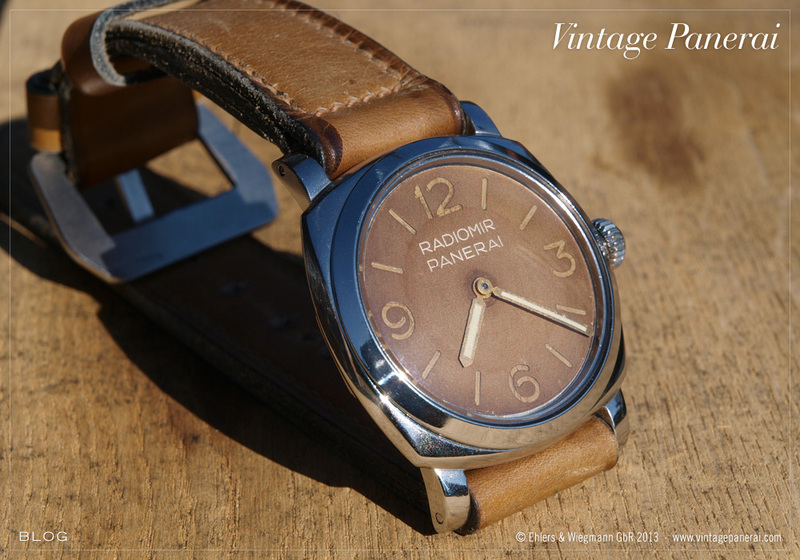 6154 “Small Egiziano” is the third and last Vintage Panerai watch to be auctioned at Phillips. Read more about this watch in our Watch Point. One day later, 14 November 2016, Christie’s is featuring two Vintage Panerai watches in their Sale 1417. The morning session starts at 10 am (lots 1-146) in which a Ref. 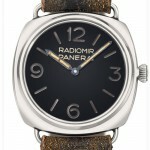 3646 / Type B with “Radiomir Panerai” dial and “Xa FLOTMAS” engraving on its caseback will be auctioned (lot 99). The afternoon session starts at 2 pm (lots 147-236), in which a Ref. 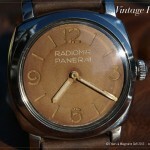 3646 / Type C with “Radiomir Panerai” dial will be up for auction (lot 209). Read more about these two Ref. 3646 watches in our Watch Point. Watches of the Ref. 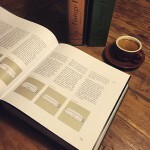 3646 / Type B, Type C and Type D are featured in our book “The References” (first volume / 1930’s-1940’s) in chapter II.II-IV. 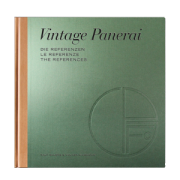 Chapter VII and VIII.II of “The References” (second volume / 1950’s-1960’s are featuring watches of the Ref. 6154 and Ref. 6152/1. Visit our bookstore for more info. 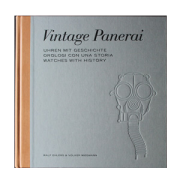 Attractive to the eyes of many Vintage Panerai collectors, brown faded dials are featured in our book “The References” in chapter II.I (3646 / Type A) on page 58-91. Read more on this famous watch here. 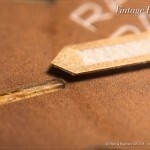 The detail in the photo on the left shows the brown faded “Radiomir Panerai” dial of a Ref. 6154 in chapter VII (one of five different watches of this reference introduced in this chapter on page 784-867). Read more about this reference here. Chapter VIII.I features a Ref. 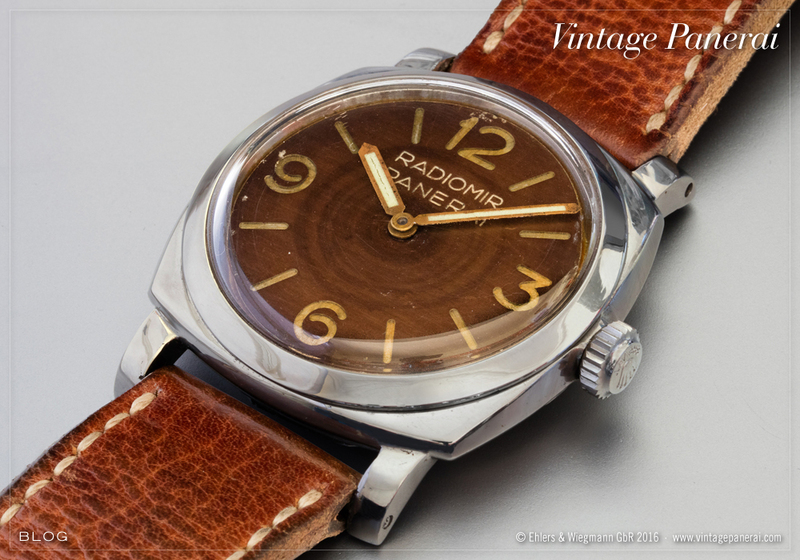 6152/1 (with Rolex movement) with brown aged “Radiomir Panerai” dial on page 902-909, followed by two Ref. 6152/1 watches with Angelus movement in chapter X.III on page 1236-1259 (both with “Luminor Panerai” dials). Read more about the Ref. 6152/1 watches with Angelus movements here. 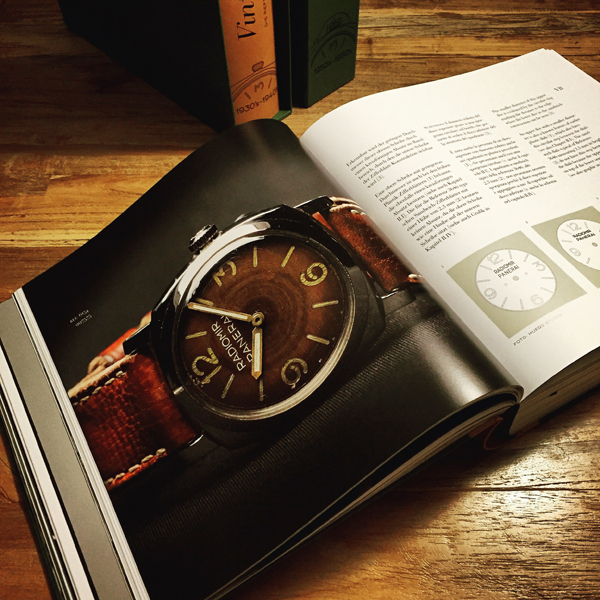 Last but not least, a Guido Panerai & Figlio depth gauge, calibrated to 30 metres, with brown aged “Radiomir Panerai” dial is featured in chapter XI.II on page 1336-1337. Find more about the chapter XI.I and XI.II featuring different instruments here. 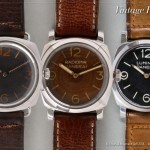 November will bring remarkable Vintage Panerai watches to auction. 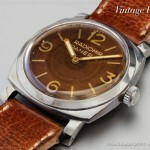 Phillips announced to have three columns of the Panerai DNA in their Geneva Watch Auction: FOUR. A German “Kampfschwimmer” Ref. 3646 / Type D, used in the Second World War, has been introduced in our Watch Point here. 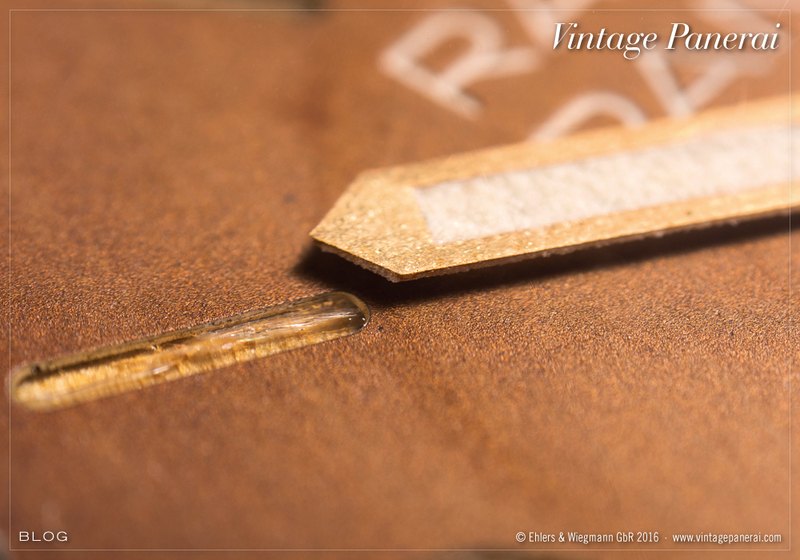 This warbird with anonymous sandwich dial is one of the very few watches with original strap and pin buckle – unpolished and with quite some patina. The “Maserati” amongst Vintage Panerai references because of its flat, elegant and streamlined case is introduced in our Watch Point here. This rare Ref. 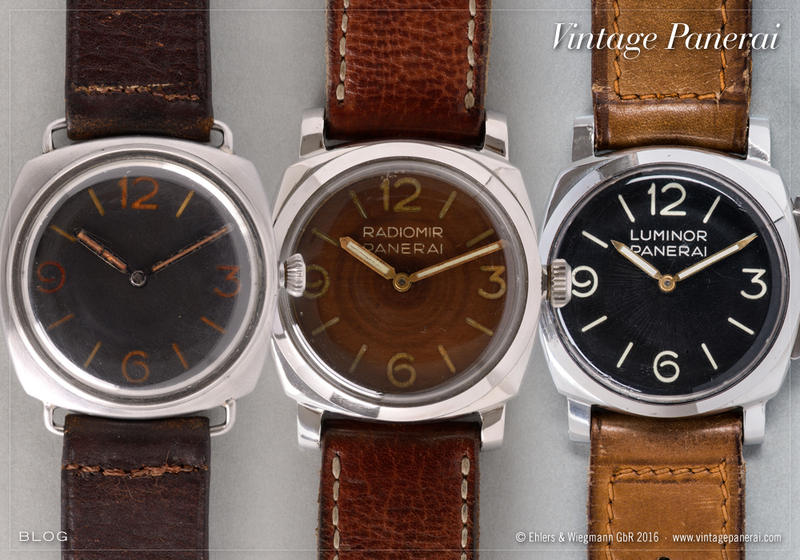 6154 “Small Egiziano” with brown “Radiomir Panerai” dial is up for auction being a “collectors’ set”, including a Guido Panerai & Figlio depth gauge, underwater torch and replacement strap with “GPF – Mod. Dep.” pin buckle. 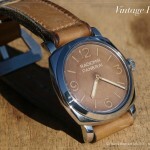 The third column of the Panerai DNA in the Phillips Geneva Watch Auction: FOUR is a Ref. 6152/1 “Luminor Panerai” with Rolex movement and the legendary crown-protecting device from Panerai – an icon of the brand. Read more about this watch in our Watch Point here. Phillips will feature a very rare Ref. 6154 “Small Egiziano” in their Geneva Watch Auction: FOUR. Between the different Vintage Panerai references, the 6154 is one of the rarest and most attractive because of its unique flat case design and only a small number of watches existing today. 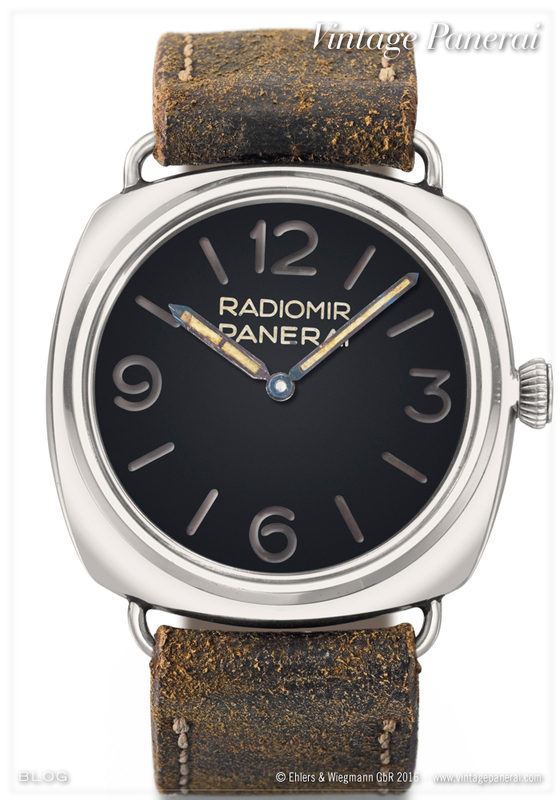 The auction lot includes a Guido Panerai & Figlio leather strap with “GPF – Mod. Dep.” pin buckle, a depth gauge and a rare underwater torch, known to be used by Egyptian frogmen in the 1950’s and 1960’s. 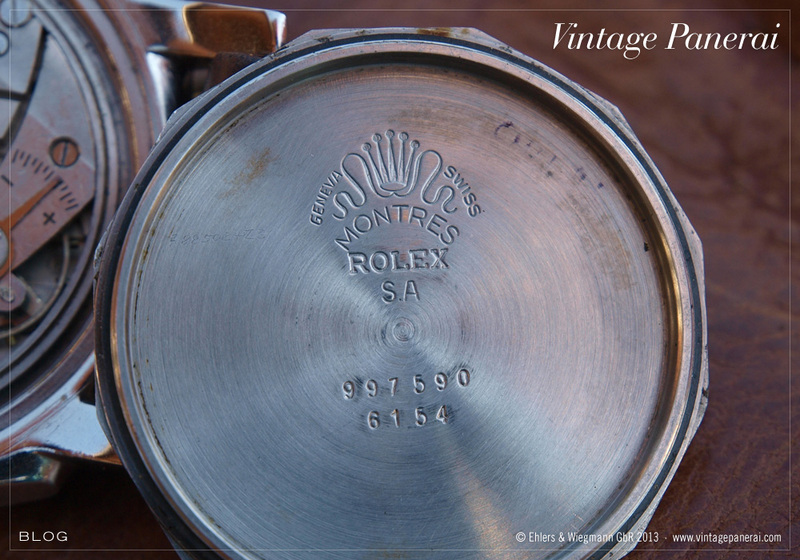 This particular watch can be traced back to the year 1995 when it was auctioned at Antiquorum in Geneva. Two years later, in 1997, it was published in the book “Militari da polso” on page 60. The watch was also published in our book “The References” (2009 edition) on page 197 and again – in detail – in our new book “The References” 1950’s-1960’s on page 808-817. The watch appears with brown faded “Radiomir Panerai” dial, 8 mm Rolex crown and Rolex 618 / Type 1 movement. Read the historical background on watches and instruments from Guido Panerai & Figlio used by the Egypt frogmen in chapter VII and IX of “The References” 1950’s-1960’s, including rare photos of an Egyptian frogmen wearing Guido Panerai & Figlio instruments (page 794, 1064 and 1068). Further info on this watch (lot 153) can be found here. The Red Sea, the Straits of Tiran, the Gulf of Aqaba, even the shores of Dakar (Senegal) and Abidjan (Ivory Coast) – target zones of the Egypt frogmen during the Suez Crisis, the Six-Day War and the Yom Kippur War. Not very much has been ever published before about missions against enemy ports, ships and oil platforms during the conflicts between Egypt and Israel. In the mid-50’s, both Egyptian and Israeli special forces attended separate training courses in Italy to learn the skills for underwater missions from their Italian instructors. After our search for historical documents and with the support of a high decorated Egypt frogmen veteran we were able to put a spotlight on some of the missions carried out decades ago. 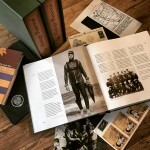 Read the historical background on watches and instruments from Guido Panerai & Figlio used by the Egypt frogmen in chapter VII and IX of “The References” 1950’s-1960’s (second volume), accompanied with rare historic photos (page 794-795 shown in the coffee table shot above). 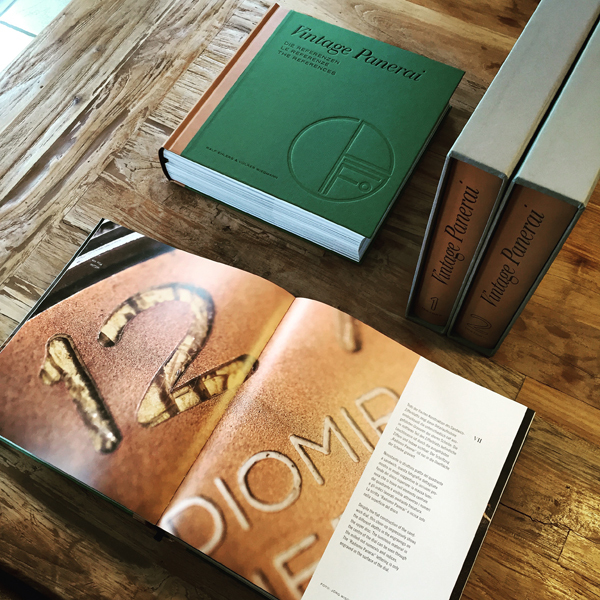 The new “The References” books (two volumes with 696 pages each) can be ordered only in our bookstore. Enjoy reading! The second volume of our new book “The References” 1950’s-1960’s starts with a view on the three famous References and the historical background on the years after the Second World War (page 704-719). A sigificant and impressive quotation of Admiral Gino Birindelli (commander of the Italian COMSUBIN underwater special forces in the years 1948-1950 and 1954-1956) marks the beginning of the second volume with a total of 696 pages. New maritime special units were set up during the same period in which Guido Panerai & Figlio was producing watches with the References 6152, 6154 and 6152/1 – big and bold cases with strong lugs and 8 mm Rolex crown, soon followed by the additional crown-protecting device on watches of the Reference 6152/1 and GPF 2/56. The coffee table shot shows page 810-811, one of the Reference 6154 watches featured in chapter VII. 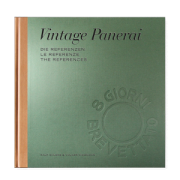 Chapter VI features comparing photos and technical illustrations to show the differences between the References 6152, 6154 and 6152/1 which were produced from the early 1950’s onwards. Aside an unique “pile shot”, which shows a side view on three different 61XX watches on page 732, different case dimensions, markings and hallmarks are described. The coffee table shot shows technical illustrations on page 738-739. Information on “The References” 1950’s-1960’s (second volume) can be found here. Our new “The References” books can be ordered only in our bookstore. Learn how to order in our FAQ section. 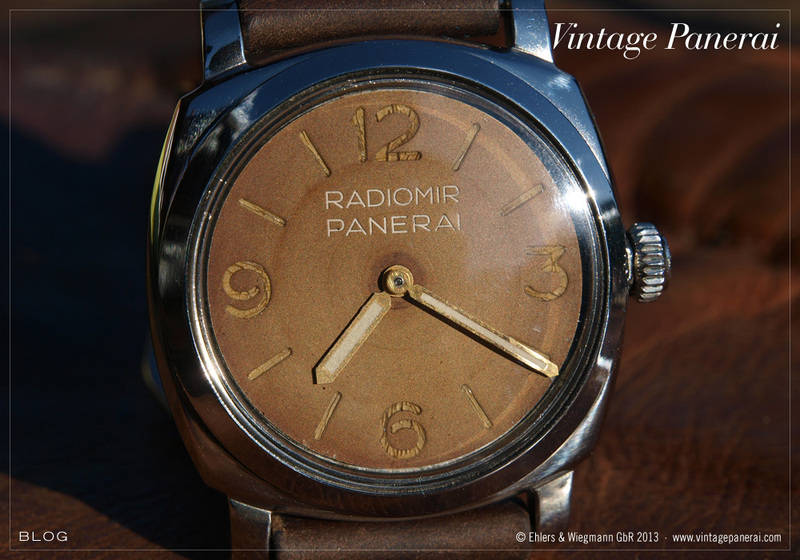 Ralf captured the wonderfully aged brown “Radiomir Panerai” dial of this Ref. 6154 “Egiziano Piccolo” (small Egiziano). Faded Colors and cracked luminous markers and numbers are giving this watch a very Special appearance and unique look. 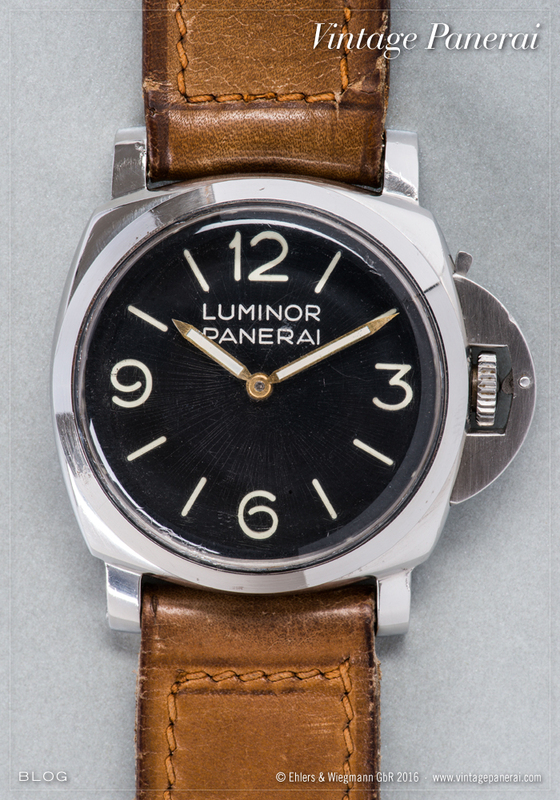 In its flat 47 mm stainless steel case, it is today one of the rarest Vintage Panerai watches. The reference 6154 was produced for the Egyptian Navy in 1954 in very small numbers – until today only a few watches surfaced into the Vintage Panerai world. Compared with the references 6152 and 6152/1, the 6154 is even more elegant and almost “streamlined” which gives it a special nickname in the Vintage Panerai world: “the Maserati amongst Ferraris”. Ralf captured his stunning Ref. 6154 “Egiziano Piccolo” in a bright afternoon sun last summer. Today I stumbled over another photo of those which he sent me for use in our blog – the view from the side shows the unique flat 47 mm case and the wonderful dial. 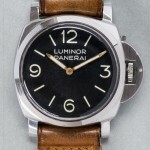 Without a doubt this reference is one of the greatest watches produced by Panerai. It was produced for the Egyptian Navy in 1954. The brown aged “Radiomir Panerai” dial and the 8 mm Rolex crown gives it an striking appearance. 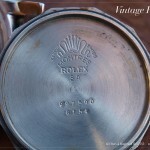 You can find a photo of the inner caseback with the special Rolex decoration here.